Slanting the Story is a powerful and provocative exposé of the real “right-wing conspiracy”: the well-orchestrated efforts of conservative foundations and think tanks in recent years to use the media to dominate debates in American policy. Award-winning investigative reporter Trudy Lieberman shows clearly and convincingly how right-wing think tanks have moved their ideas to the front of the national agenda and engineered sweeping changes in public policy. She also reveals how a gullible mainstream media has consistently taken them at their word and spread their ideas. In many ways, Lieberman argues, organizations like the Heritage Foundation, the Cato Institute, the Manhattan Institute, and others have “beaten Ralph Nader at his own game,” closely modeling their efforts on the successes of the consumer, environmental, and public–interest movements of the 1960s and 1970s. 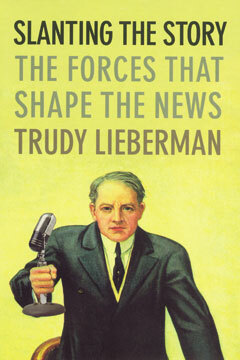 Through four well–documented case studies of right-wing policy strategies of recent years—to dampen public support for the AARP and the Social Security program, to gut the Food and Drug Administration’s regulatory powers, to eliminate the Head Start program, and to fundamentally change the structure of Medicare—Lieberman shows how conservative foundations and think tanks have skillfully used the media to demonize the federal government and to diminish public support for the social welfare system. Credible and full of evidence, Slanting the Story reveals the shadowy world of wealthy right-wing think tanks for the first time. This book represents the opinions of Trudy Lieberman and not those of the Consumers Union.